After many near wins, Tomas Lemoine finally has his first Crankworx gold medal, and five-time pump track queen Jill Kintner her redemption, after an epic Rotorua Pump Track Challenge presented by RockShox at Crankworx Rotorua Friday night. “I’m pretty stoked because I’ve wanted this win for so long. I’m always like third, fourth and this time I won. So I’m pretty stoked. It’s like living a dream,” said Lemoine, whose triumphant shine could only be matched by the fourth place finisher Conor Mahuika. 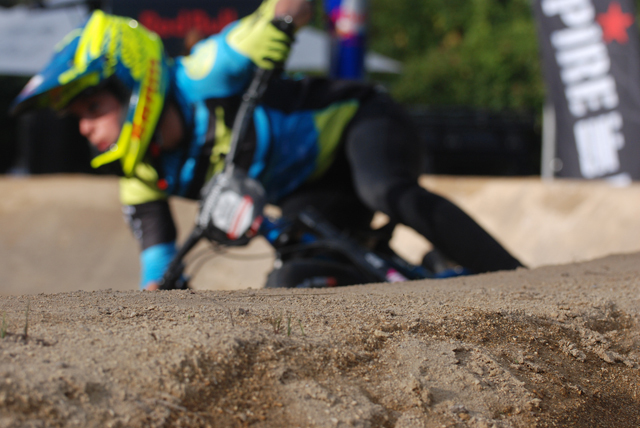 A rider from the local pump track, 16-year-old Mahuika spent almost as much time waving to the crowd and smiling for his new-found fans as he did racing, and it took him until the quarter finals to hit a match up where he would have to make up time. “I’m stoked to even be fourth. I’m used to jumping the dirt jumps, not going fast. I’m just stoked. This is the first event I’ve ever tried on a pump track. I haven’t had any practice, except yesterday, and a bit today. Seems to be working - kind of,” he laughed. On the contrary, the women’s race proved a battle of veterans and a rare life do-over for Kintner, who caught her tire and never got out of the gate in the final matchup against 2015 Queen of Crankworx and eventual Pump Track Challenge Champion Anneke Beerten in the inaugural Rotorua competition. “Last year I didn’t even get a proper race. Feels good to be back here and Anneke is a great competitor—and a worthy opponent. I love racing her, and racing here; it’s always good pressure for the final with the two of us,” she said.